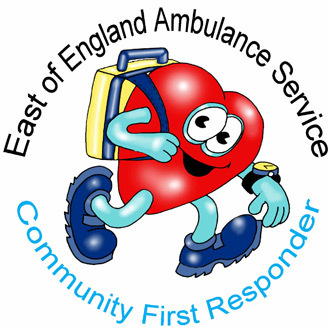 Community First Responder (CFR) schemes are a partnership between the East of England Ambulance Service NHS Trust, local CFR Groups and individual volunteers within the community who are members of those groups. CFR Schemes comprise of members of the public who volunteer to assist the Ambulance Service in their local community by attending emergency calls (of a suitable nature) within an agreed radius of where they live or work and provide basic emergency care whilst an ambulance or paramedic is en route to the patient. 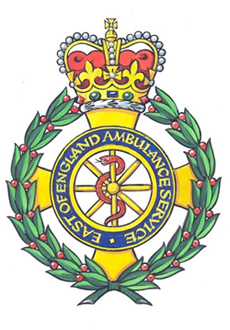 The volunteer is regarded as a volunteer employee of the Ambulance trust once inducted. As an example of how time critical emergency intervention can be, the chance of survival of a patient in cardiac arrest if de-fibrillated immediately is 85%, with the odds decreasing by 10% for every minute that passes with no treatment. Early defibrillation is therefore a crucial potentially life saving intervention which Community First responders can perform whilst the ambulance is on its way. Community First responders are also trained to administer oxygen therapy, which in a patient who is experiencing a heart attack or stroke may alleviate their chest pain and improve the patient's outcome. 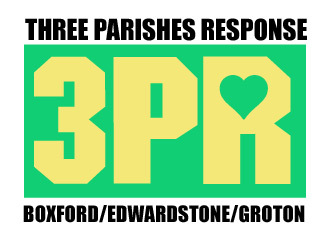 3PR was set up in 2002, it encompasses the three parishes of Boxford, Edwardstone and Groton. Running costs are relatively low, group members opt to provide their transport and fuel free of charge although recompense is available. The group receive no direct funding so any donations are gratefully received. Boxford 3PR Group train in Boxford on the second Monday of every month. Our responders are further trained and refreshed in basic Life support, use of defibrillator, pulse oximeter, use of Oxygen together with other related subjects and general first aid. Please contact Rich Wild, our co-ordinator on 01787 210946 for more details. Emergency calls (when appropriate) are directed to the group mobile phone from Emergency Operations Control (EOC) based in Norwich. Members volunteer to respond according to their personal life commitments and they must be drivers, have use of a car or similar (not motorbike), be fit and healthy and between the age of 18 to 70. A rota is drawn up each month and contained in the operations book accompanying the responder kit, responders electing to cover as much or as little as they can manage to suit their lifestyle. As a further back up a Community Public Access Defibrillator (CPAD) has been provided by the group and local parish council and situated in the archway of The Fleece Hotel in Boxford. This is for general use by the public and is activated by a 999 call. A key lock gains access to the equipment. Edwardstone Parish Council and a local trust are engaged in providing and maintaining a CPAD in the telephone box at Mill Green Edwardstone. The group is supported by a committee of former responders (bar two) chaired by the coordinator who provides the link with the Community Partnership manager. They meet on a three monthly basis to manage the group affairs.